If Reaver is the first card trashed during a turn, does the Runner draw a card? No. 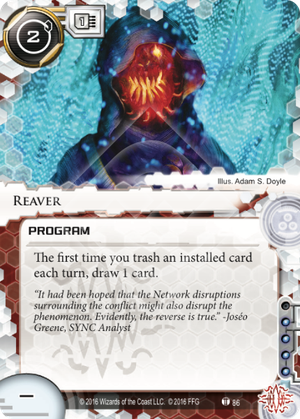 Reaver must be active when the card is trashed in order to trigger. I've been playing around with this card. It's surprisingly good. It's the first Apex card to come out since Data and Destiny. I think we were all hoping that he'd get something to patch up some of his obvious problems, but when Reaver was revealed, responses were generally tepid. "Why are they giving us a program, when our memory is already so constrained? ", "Clearly should have been a virtual resource!" etc. Apex cares about card draw. Because of his ability, you're at your best the faster you can draw [and free-install] cards. In general, when building an Apex deck, I used to plan on around 6-9 influence being spent solely on getting cards into my hand. Diesels. Quality Times. Sometimes even Safeties First. Anything to ensure a constant stream of cards to install face-down as fuel. The elephant in the room though, is "what about memory?" Apex can usually only really count on 5 max. So how to pay for Reaver, Endless Hunger, and any other tricks you need? After a lot of tinkering, I really think the answer has to be "Ditch Endless Hunger". Or maybe more accurately, start treating it as an early-game tool of aggression, rather than your whole breaker suite forever. Running off of just Endless Hunger (plus an AI and various other tricks to deal with everything else) was never easy. And it's only gotten harder, now that the corp has a lot more good ice that Endless Hunger can't break. Endless Hunger is still a decent early-game answer to gear-checks, but late game, I think it's time for Apex to just accept that Reavers + a normal breaker suite are probably a better value than Endless Hunger plus the full support suite it requires. The obvious (and probably most important) one: It combos brilliantly with Chop Bot 3000, and makes a fantastic card-draw engine. (And heck, in these troubled times of NBN tag punishment, Chop Bot's alternative benefit -tag removal - is occasionally really useful as well.) Expect chop bot/reaver combos in most Apex decks for the foreseeable future. Also like Wasteland, it triggers off of a lot of things you might not expect: Trashing Clot after a purge, for example. Or overwriting a program with a new one. Or (less useful for Apex) trashing things like Temüjin Contract, Armitage Codebusting, Daily Casts, Liberated Account, Earthrise Hotel, etc, when they run out. So yeah. Reaver - it's pretty cool! The influence is steep enough that I doubt we'll see other runners import it much, but it helps Apex a lot. I'm not convinced (yet!) that it's enough to bring Apex up into tournament viability, but it definitely gives our favorite internet-monster a much-needed shot in the arm! I've been testing this card in with The Professor: Keeper of Knowledge, combining with Sahasrara, Omar's breakers and Aesop's Pawnshop. Once the engine starts, you get a free draw and 3 per turn as long as you continue to run, which I solved with Out of the Ashes. Needs more tweaking, but surprisingly, the idea works.